It's June! Our large freezer downstairs has been defrosted and is ready for this summer's bounty! As of this afternoon the top shelf now has Quart Sized Ziploc Freezer bags each containing 2 cups of sliced Strawberries! Earlier today a quick trip to Meadowbrook Farm in East Longmeadow resulted in the purchase of 1 large tray (8 quarts) + 2 additional quarts of these luscious berries. Every year I purchase strawberries at Meadowbrook Farms and prep them for our freezer. During the frigid winter months in MA, defrosted local delicious strawberries make a wonderful topping for nutritious light Oatmeal Pancakes or on Vanilla + Strawberry ice cream. I'd never consider buying the tasteless strawberries that are sold in grocery stores when these berries are not in season here in New England. This is also a tradition of mine that started in my childhood. However, then my family would drive out to the strawberry patch and harvest our supply. The prepping was done after we returned home. As time went on my DH & I did likewise. 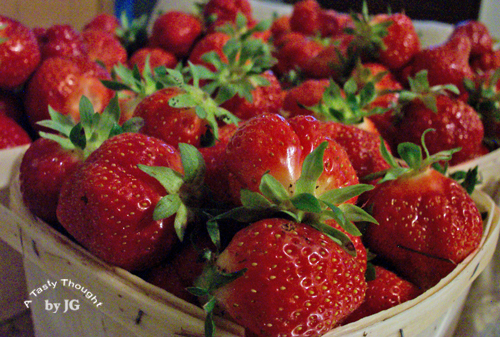 Now, we purchase the fresh strawberries directly from Meadowbrook Farm. Strawberries are so easy to prep for freezing. The tops of these luscious juicy red berries are cut off and then the berries are cleaned: Double rinse in cold water and drain. Over the years I've learned that slicing them in half or thirds before freezing results in wonderful shapes when served on ice cream or on pancakes. When making Freezer Jam - remember to make 1 batch at a time. The directions are located inside the Certo box. Follow the directions exactly. Do you enjoy storing local produce for future use? Do you prepare jam or Freezer Jam? Suddenly ... there was only one bag left! This was a surprise! Where did the large supply of frozen blueberries go? This sole bag would be devoured, but what delicious food would be prepared? 1/2 Cup Milk - I use 1% Milk. Combine all dry ingredients in a large bowl and stir well. In smaller bowl combine Whole Egg and Egg Whites, beat with fork. Add 1 Cup Buttermilk, Milk and Olive Oil to Egg/Egg Whites. Stir. Add remaining 2 Cups Buttermilk and stir with rubber spatula or wooden spoon. Place about 1/2 cup batter on heated griddle. I make 3 pancakes at a time on my smaller griddle. 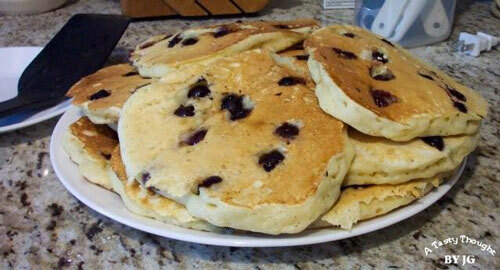 Add 8 - 10 Blueberries to the top of each pancake. Turn over when first side is lightly brown and then brown other side. 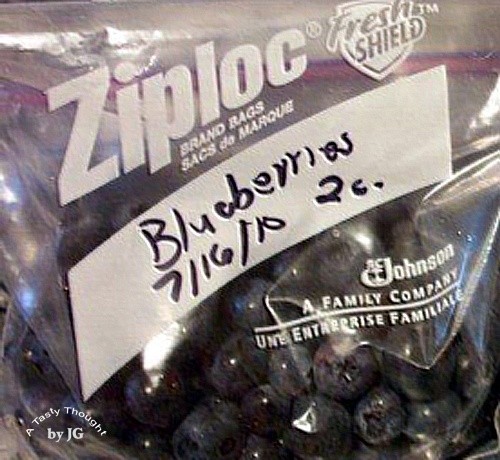 *Remember to rinse fresh Blueberries under cold water before using. Are you making a special breakfast for Sunday? While glancing through the Big Y's sales flyer last week the fresh New Jersey Zucchini and Summer Squash sure caught my attention! In the summer one of our fave veggie dishes that goes so well with grilled fish is Sauteed Combo, so I purchased 3 small tender Zucchini and also 3 small yellow Summer Squash. Fresh veggies are delicious! This is a quick to make & yummy dish that does not need much attention. Wash veggies in cold running water. Cut Zucchini & Summer Squash in slices. Heat Olive Oil in Saute skillet, Medium heat. 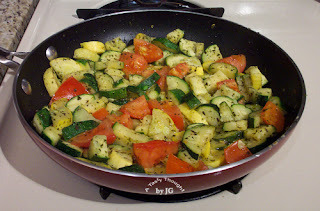 Place Zucchini & Squash in skillet and saute. Sprinkle on Oregano, Basil & Garlic Powder, as desired. Saute until tender, turning slices over - usually 20 - 25 minutes. Cut tomato into chunks and add into skillet. Heat until tomato is warm. Last Wednesday about 3 hours after I wrote my last blog post a very dramatic and tragic change occurred in my area. A tornado started in Westfield, MA and intensified as it hit West Springfield. Then, it passed over the Connecticut River and hit Springfield and kept going. It traveled for 39 miles. A total of 3 tornadoes passed through this area - the other 2 were weaker. Springfield, MA borders my town of Longmeadow on the north. My husband & I drive many times through the South End of Springfield into Downtown. The EF3 tornado hit this area - causing devastation - and then continued onward causing additional destruction through many more neighborhoods of Springfield and to other towns in its path. The South End of Springfield is about 2 miles from my home and about 10 minutes driving distance. We residents of Longmeadow did not see the wrath of the EF3 tornado on our homes or property. Many families lost their homes and apartments. Buildings were destroyed. Four people lost their lives. Schools will re-open tomorrow. The American Red Cross is an organization that is aiding the residents of Springfield, West Springfield, Monson and other towns that were affected. Last week my husband & I made a contribution to help our neighbors. If you would also like to make a donation to the American Red Cross to help in this crisis in Western MA, it would be greatly appreciated by the residents of Western MA. The sun has been brightly shining and it feels like summer has arrived! My glass pitcher found its way out of the cabinet and has been put to work. Solar Green Tea! :) This is not prepared with matcha - the fine powdered green tea that is used in the Chanoyu - but made with tea bags. This past weekend family members were in town and cold unsweetened Solar Green Tea was a hit! It's similar to the tea that our MIL/mom made many years ago. She lived in the sunny state of FL and used cold water, bags of black tea and the sun to prepare her beverage. Her thought always was - "Why purchase it when you can make it so easily yourself?" I like that thought! I also like Solar Green Tea. The method is easy. Easy is good! 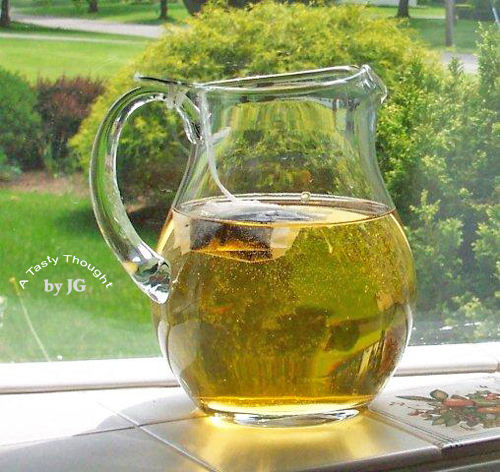 On a sunny day I fill my glass pitcher with cold water and place it on my front window sill. Add 3 Green Tea teabags and forget it for 3 - 4 hours. Later, remove the tea bags, cover and place in the fridge. While my Solar Green Tea was brewing, I was on my computer. Whenever I looked out the window in my Computer/Sewing Room, the gorgeous Peonies were in view! This afternoon I need to "brew" another pitcher! Yesterday afternoon as I was "brewing" my pitcher of Green Solar Tea, I didn't know that Mother Nature was brewing a surprise for us residents of Western Massachusetts. 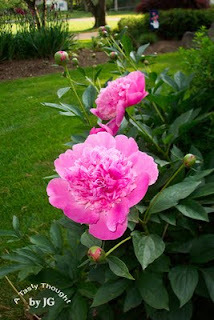 The city of Springfield borders my town of Longmeadow on the north - here in MA. We drive into the South End and Downtown so often. We are accustomed to snowfall, but not tornadoes. Today has been a day of helping and thinking of our neighbors.